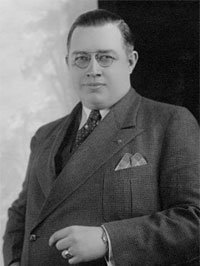 Today in Masonic History Harold Roe Bartle passes away in 1974. Harold Roe Bartle is an American businessman and politician. Bartle was born in Richmond, Virgina on June 25th, 1901. His father was a Presbyterian minister and would greatly influence Bartle as he grew up. Later in life many of Bartle's decision would be based on what he felt his father would do in those circumstances. It was only the lack of income that Bartle disliked about his father's life, which prevented Bartle from following in his fathers footsteps. At the age of thirteen Bartle attempted to join the military, his father produced proof of his age and Bartle was discharged immediately. After attending the Fork Union Military Academy, Bartle attended the University of Chattanooga. He would not graduate though after he contracted pneumonia and was forced to return home. In 1920, Bartle was admitted to the bar in Kentucky. This was a year before he graduated with a law degree from Hamilton College of Law, a correspondence college in Chicago. Bartle would work for a law firm in Lebanon, Kentucky. The job did not thrill Bartle and very quickly decided the law was not for him. Despite this he was the Prosecuting Attorney in Lebanon from 1920 to 1922. While living in Lebanon, Bartle oversaw a scout troop, which he was very passionate about. In 1923 and 1924, he was the Executive for the Cheyenne Council for the Boy Scouts of America. From 1925 to 1928 he would hold a similar position in St. Joseph, Missouri. From 1928 until 1955 he would be the Executive for Kansas City Area Council. While working for Boy Scouts, Bartle had began public speaking and was receiving fees of $1,000 and up for his speeches. He would even travel to Nice, France where his rich and powerful voice would blow out the Public Address system. Bartle would also be appointed to various boards of directors for banks and other businesses. In the 1950's after the Defense Production Act was signed, according to his daughter, President Harry Truman personally asked him to be director of the Economic Stabilization Board. He would have to resign from more than 57 boards to avoid any conflicts of interest. In 1955, Bartle would run for Mayor of Kansas City. The position at the time had no real power and the Mayor was essentially a city council member-at-large. He would serve two terms in the position. During that time he would oversee the desegregation of city hospitals and the hospitals taken out of the control of the politicians, he supported the advancement of African-American police officers, and oversaw the initial construction of the Kansas City Airport. Also during his two terms the the Dallas Texans, a professional football team would move to Kansas City and adopt his nickname "Chief" for the team name. Bartle passed away May 9th, 1974 from complications related to diabetes and heart disease. Bartle was a member of Lebanon Lodge No. 87 in Kentucky.